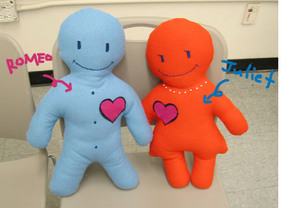 Romeo and Juliet, even though their in-laws didn’t like each other, finally got married. Time passes by, and they feel their love start to fade dealing with busy life in the big city. They decide to go see a marriage counselor, Dr. Frankenstein. 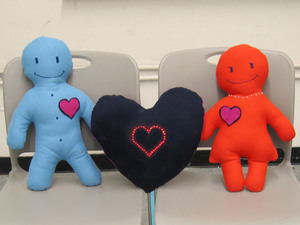 Dr. Frankenstein, the mad scientist he was, invents a magic heart that represents the burning love between Romeo and Juliet. 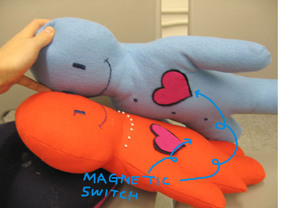 Romeo and Juliet have magnetic switches in their hearts. 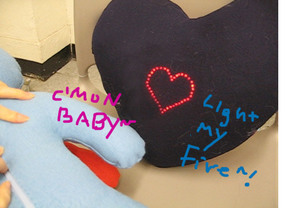 Whenever they get the groooooooooove on, the magic heart lights up and makes sounds! "C'mon baby~", "Light my fire!"